Peach season is starting and I was thrilled to be buying some local peaches. However, I was less thrilled to taste these peaches...they were beautiful and juicy, but not as sweet as I expected! Seriously a big disappointment! So I knew I wouldn't be eating these peaches without a bit of gussying up! I went through a range of things I could make with peaches and finally decided on making some fun Peach Fritters with Buttermilk Glaze. These fritters and poppable donut bits all stuck together with diced peaches and glazed with a sweet and tangy glaze. What's not to like about that!? I found this recipe on Food52.com, It seemed like a simple yeast donut recipe chopped up into fritters! But my first batch was a bit of a bust, I really should take pictures of my failures because we all have them, but in the moment I feel so deflated with my self I end up dumping the batch of dough into the garbage before realizing that I should have snapped a shot of it. But I'm pretty sure that it didn't work out because of the flour I used. The recipe calls for All Purpose flour and I always thought all purpose flours were the same, that is until I found a bag of White Lily all purpose flour. I was actually super excited for it! It's such a coveted brand of flour I was ecstatic to find it in my supermarket (you can't find this stuff in NYC) But I've come to realize that White Lily Flour is great for biscuits and some cake recipes, not so much for breads and donuts that need a stronger flour. And although it says it's all purpose, I found the flour to be much softer that other all purpose flours and thus absorbs liquid differently. So for my second batch of dough, I stuck with the tried and true Gold Medal flour. Take each portion of dough and take 1/3 of the little squares and put them aside. Place 1-2 Tbsp of diced peaches on the bottom 2/3's of your dough then top with the reserved little squares. 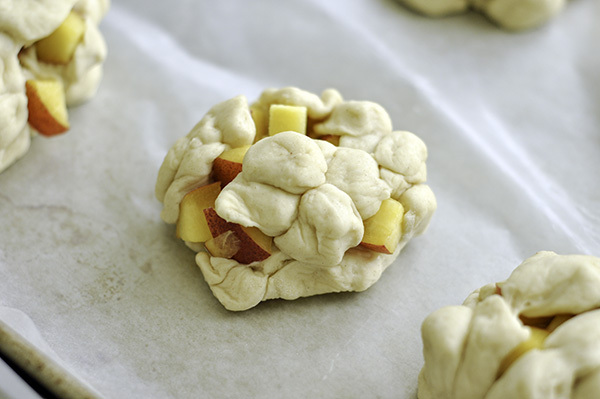 Squish them together slightly and place the formed fritter onto a parchment lined baking sheet. Keep going until all your fritters are bursting (figuratively speaking... you don't want your peaches bursting out!) with Peaches! In a small pot, heat the milk, water, and butter until the butter has melted and the mixture is warm. Remove from heat and allow to cool to lukewarm. Mix the flour, nutmeg, cinnamon, salt, sugar, and yeast in the bowl of a mixer fitted with paddle attachment. Add the warm milk mixture and mix to combine. Add the eggs, scraping the bowl well. Replace the paddle attachment with a dough hook and turn the mixer up to medium and mix until the dough begins to pull away from the edges (approx 3-4 minutes). Spray a large bowl with non stick spray and place finished dough into the bowl, cover and allow to rise for about an hour. Turn the town out onto a floured board and roll it out into a rectangle about 1/2" thick. Perfection is not what we're after here so no need to measure. Using a sharp knife or a bench scraper, cut 1/2" vertical strips out of the rolled dough. Then cut 1/2" strips horizontally out of the dough creating 1/2" dough squares. Separate there squares into 16 equal portions. Repeat with the remaining portions of dough. Cover with greased plastic wrap and allow to rise for another 25-30 minutes. In a heavy dutch oven heat your oil on high to 350F. Then reduce the heat to medium high and you're ready to fry! Slowly drop each fritter into the oil and fry for 2-3 minutes on each side.Allow to cool on a wire rack for about 10 minutes before glazing. To make the glaze whisk together the powdered sugar, buttermilk and cinnamon. Dip the top of each cooled fritter into the glaze and place on a wire rack to allow the glaze to set.